One has to wonder if the Fed understands that it is about to pull rug out from underneath its own smoke-and-mirrors hype show. Raising rates into a fundamentally weak economy is a great way to choke out growth. Risk asset prices have risen due to the Fed policy, and with the cessation of QE printing, and corporate buybacks, the perpetual bid underneath this historically overvalued stock market is about to be removed. What will be left? Collapsing zombie companies taken off ZIRP fiscal life support and the retrospective wonder that anyone mistook such brazen market manipulation as economic recovery. The Fed Minutes from its meetings on May 1st and 2nd were very interesting possibly because Fed chair Powell is still new and the Fed is absorbing new officials into the fold this year. 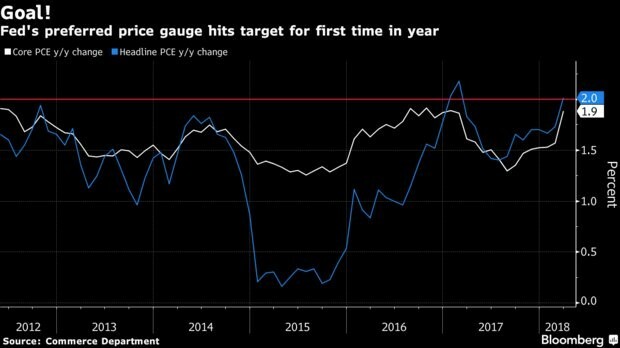 The outlook of the Fed was altered to the dovish side which is surprising considering the fact that it is in a hike cycle and the economic data has mostly reflected an improvement in the economy. The CNBC GDP tracker expects Q2 GDP growth to be 3.5% as of May 23rd. We are still early in the quarter, but the results look good. To be clear, the data the Fed had a few weeks prior was less complete, but there was similar optimism about Q2 as there were signs of improvement. The Fed’s two mandates are stable prices and maximum employment. With the past few years showing improvement in the prime age labor force participation rate, the goal of reaching maximum employment is winding to a close. We are the point in the cycle where the Fed usually cares more about inflation than supporting the labor market. That worries risk assets as the Fed could raise rates quickly even though it hasn’t in this cycle. In fact, this rate hike cycle has been the slowest since 1977, yet the rhetoric has been the most hawkish since 2006. The market also has the Fed’s balance sheet unwind to worry about, so it might be more sensitive to rate hikes than it would otherwise be.